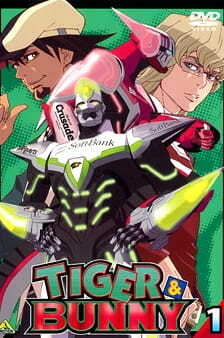 The pilot episode for Tiger & Bunny released on the first DVD & BD volume. Okay so... at first I thought this was a joke. I mean, it starts out with a guy speaking English who's half the time got a British accent going on. There was kana when he talks so that made me start thinking it might not be a joke. I ended up looking on the net and found that it really is real soooo here's my review! First off, Blue Rose's hair is freakin' awesome. I love the long look more than the short personally. Bunny and Tiger don't have any logos on their suits (I didn't notice if BR had them or not) but they pose in ways that are actually meant to show off those logos. I'm guess the pilot was done before they had sponsors hehe. The absolute best part was when they introduced Bunny and Tiger as "The Rookie with Glasses" (megane no ruukii / メガネのルーキー) and "The Veteran with a Beard" (hige no betaran / ヒゲのベタラン). I mean, this little 2min 13sec spot is only going to appeal to fans of the show, but it gave me a laugh while I drank my morning coffee, hehe.